The new campaign calling for the release of Israeli agent Jonathan Pollard from prison in the US is in many ways a curious development. Pollard was arrested in 1985 and convicted on one count of transferring classified information to Israel during his service in US Naval Intelligence. He pleaded guilty to the charge in the framework of a plea bargain in which the US attorney pledged not to request a life sentence. The renewed interest in Pollard's plight has garnered a great deal of attention in the local media as well. After Korb's initial call for Pollard's release in an op-ed published in The Los Angeles Times in October, Ma'ariv published a cover story in its weekend news supplement about Pollard's suffering. Reporter Ben Caspit demanded that Prime Minister Binyamin Netanyahu formally request that Obama commute Pollard's sentence and release him from prison. Ma'ariv's article caused a spike in media coverage of Pollard in November. And this month, Pollard was back in the news when the government intervened to help his former wife Ann and her father make aliya after the consulate in New York discovered they were both ill and living in poverty. Public pressure on Netanyahu seems to be working. Before Monday, Netanyahu refused to make any public statements regarding Pollard. 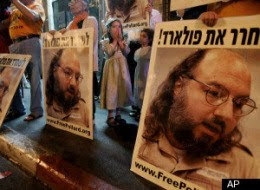 At his recent meeting with Obama, he refused to deliver a letter signed by 109 of the Knesset's 120 members formally requesting Pollard's release. On the other hand, heavy public pressure caused Netanyahu to initially agree to speak at Monday's rally for Pollard's release at the Knesset. Netanyahu canceled his appearance at the last moment however, and insisted on sufficing with a private meeting with Korb and Pollard's wife Esther. Obviously more pressure can and should be applied. In light of Obama's attitude, at first blush it makes more sense to try to advance Pollard's case through quiet diplomacy. This is the argument that cabinet secretary Zvi Hauser made in testimony before the Knesset earlier this month. Hauser appeared before the State Control Committee to respond to State Comptroller Micha Lindenstrauss' recommendation that Netanyahu set up a ministerial committee to oversee a public, formal campaign calling for Pollard's release. But on second thought, the current campaign is eminently sensible. To understand why, we must consider the relative benefits of quiet, behind the scenes diplomacy and loud, public diplomacy. Quiet diplomacy works well when all sides share a perception of joint interests and when its exposure is likely to change that perception. For instance, Israel and its Arab neighbors perceive a shared interest in blocking Iran from acquiring nuclear weapons. But given the nature of Arab politics, that perception, which enables the likes of Saudi Arabia, Egypt and Bahrain to work with Israel on preventing Iran from developing nuclear weapons, disappears the moment cooperation is made public. Likewise, Lebanon's Sunnis and Christians share an interest with Israel in defeating Hizbullah. But their ability to work with Israel on defeating Hizbullah is destroyed the moment such work becomes public. Quiet diplomacy does not work when there is no perception of shared interests. For instance, regimes that repress human rights to maintain their grip on power have little interest in cooperating with free societies, when the latter demand that they free political dissidents from prison. Quiet diplomacy in the field of human rights between the US and the Soviet Union during the Cold War never succeeded, because the Soviets realized that opening up their tyranny to domestic criticism would destroy the system. And today, as Cairo's fake parliamentary elections and Teheran's continued repression of democracy protesters shows, the Obama administration's quiet diplomacy with the Muslim world regarding human rights and democracy has utterly failed. It is in cases like this where public, noisy diplomacy comes in handy. Public campaigns are helpful when one government wishes to persuade another to do something it doesn't want to do. Last week we received a reminder of the effectiveness of such behavior with the publication of protocols of meetings held by president Richard Nixon in the Oval Office. "The emigration of Jews from the Soviet Union is not an objective of American foreign policy. And if they put Jews into gas chambers in the Soviet Union, it is not an American concern. Maybe a humanitarian concern." On the face of it, Kissinger was right. Using humanitarian considerations to weaken Soviet tyranny probably didn't help US arms control negotiators score points with Leonid Brezhnev. But on a deeper lever, he was completely wrong. The Jackson-Vanek amendment not only forced the Soviets to permit limited emigration of Jews. It started a process of opening the Soviet system, which ended up destroying the regime just a decade later. Since taking office, Obama has only used public diplomacy in the Middle East to convince one government to take action it believed was antithetical to its interests. Last year he waged a forceful, unrelenting public diplomacy campaign to convince Netanyahu to abrogate Jewish property rights in Judea and Samaria. And it worked. Although it harmed the sacrosanct pillar of Zionism that Jewish rights are nonnegotiable, although it weakened Netanyahu's standing with his party and voters and although it empowered the Palestinians to expand their political war against Israel on the international stage, Netanyahu gave in. The public pressure Obama exerted on him compelled him to act against his interests. The US is not an evil empire. And it is hard to see how a clear demand for Pollard's release on humanitarian grounds will have any fundamental impact on its nature. And that is fine. But the fact is that Obama has no interest in freeing a suffering Israeli agent who was railroaded by Weinberger and remains in prison due to the efforts of Israel haters who wrongly insist he did untold damage to US national security. Indeed, many of Pollard's detractors are members of Obama's political camp. The odds are poor that a public campaign to win Pollard's release will succeed. But if Israel is going to do anything at all, its actions should be concentrated in the public realm. As we have seen, quiet diplomacy, the strategy the Netanyahu government tried until now, will never get him out of jail. And Israel must act. Pollard's unfair, unjustified and discriminatory sentence and treatment are a dismal symbol of Jewish vulnerability. His personal suffering is inhumane, real and unrelenting. He needs us to stand up for him. And so we must. And so we will. The time has come, against all odds to shout that Pollard must be freed. Now.